Not sure if you heard, way over there in Japanland, but Big Boss Crecente's spending his evening at the Cervantes Masterpiece Ballroom, looking to unload some loot and raise some money in the name of Child's Play. Sounds like Kind Of A Big Deal, what with all the roadies, sound wranglers and video game industry folks rolling into town for the event. Charitable though it all may be, the sting of shipping off my Uncharted 2: Among Thieve Fortune Hunters Edition to Crecente is still a little sore. You know how I love possessions! 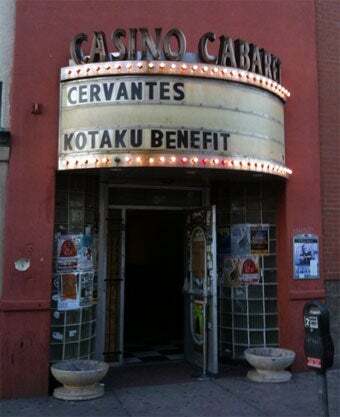 As you can see, the "Kotaku Benefit" is worthy of marquee space at Cervantes. Glad we weren't billed below "Puppet Show" or some other such humiliation. Anyway, long time no talk. How's the swine flu treating you? You going to Texas for Xmas this year? Need to book my own travel to Florida and a few PSP and DS games for the trip.